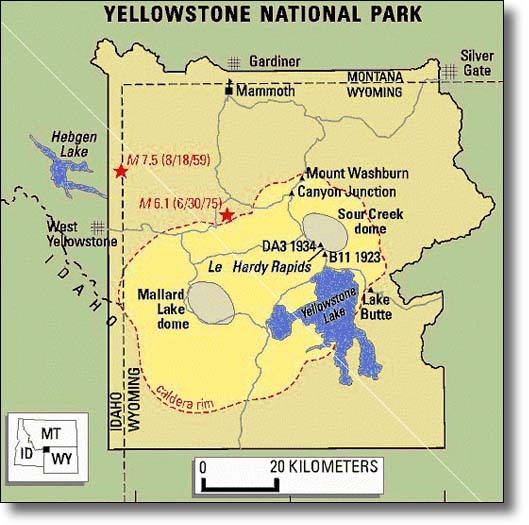 The Yellowstone Caldera is the volcanic caldera in Yellowstone National Park and is the reason Yellowstone has all the geysers, hot springs, and fumaroles. 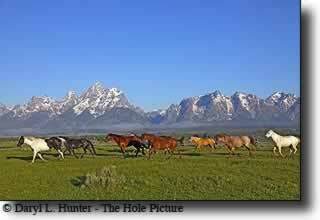 The caldera is located in the northwest corner of Wyoming, in which the vast majority of the park is contained. The perimeter of the caldera measures 34 miles wide by 45 miles long. After a BBC television science program (Horizon) coined the term super volcano in 2000, it has often been called the Yellowstone Super Volcano. Yellowstone National Park and the area immediately west of the Park is historically among the most seismically active areas in the Rocky Mountains. Small-magnitude earthquakes are common beneath the entire caldera, but most are located along the Hebgen Lake fault zone that extends into the northwest part of the caldera. A magnitude 7.5 earthquake occurred along this zone in 1959. These seismic events are attributed the volcanic nature of Yellowstone. What happened during the last eruption of a super volcano? The last eruption of a super volcano was in Toba, Sumatra, and 75,000 years ago. It had 10,000 times the explosive force of Mount St. Helens and changed life on Earth forever. Thousands of cubic miles of ash were thrown into the atmosphere, so much that it blocked out light from the sun all over the world. Two thousand five hundred miles away 14 inches of ash coated the ground. Global temperatures plummeted by 21 degrees. The rain was so poisoned because of the gasses that it turned black and strongly acidic. Mankind was pushed to the edge of extinction; the population forced down to just a couple of thousand people worldwide. Three quarters of all plants in the Northern Hemisphere were killed. When Yellowstone National Park experienced its largest eruption 2.1 million years ago, massive volcanic depressions formed, known as “ calderas.” The explosion also spewed volcanic ash over half of the United States, reaching areas of as far away as Texas, Louisiana and southern California, according to the U.S. Geological Survey. A similar, smaller but still huge eruption occurred 1.3 million years ago. This eruption formed the Henrys Fork Caldera, located in Island Park, west of Yellowstone National Park, and produced another widespread volcanic deposit called the Mesa Falls Tuff. The region’s most recent caldera-forming eruption 640,000 years ago created the 35-mile-wide, 50-mile-long Yellowstone Caldera. Pyroclastic flows from this eruption left thick volcanic deposits known as the Lava Creek Tuff, which can be seen in the south-facing cliffs east of Madison, where they form the north wall of the caldera. Huge volumes of volcanic ash were blasted high into the atmosphere, and deposits of this ash can still be found in places as distant from Yellowstone as Iowa, Louisiana, and California. 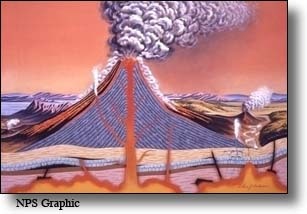 Super volcanoes differ from normal volcanoes in many ways. The stereotypical volcano is a towering cone, but super volcanoes form in depressions in the ground called calderas. When a normal volcano erupts, lava gradually builds up in the mountain before releasing it. In super volcanoes when magma nears the surface it does not reach it, instead it begins to fill massive underground reservoirs. The magma melts the nearby rock creating extremely thick magma. The magma is so thick that volcanic gasses that normally trigger an eruption cannot pass through the magma, so a massive amount of pressure begins to build up. This continues for hundreds of thousands of years until an eruption occurs, which blasts away a massive amount of earth, forming a new caldera. 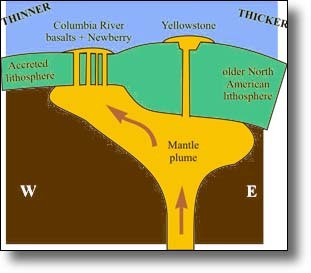 The Yellowstone Caldera is one of the largest and most active calderas in the world. 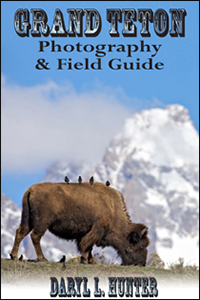 The spectacular geysers, boiling hot springs, and mud pots that have made Yellowstone famous, and even the strikingly beautiful Grand Canyon of Yellowstone through which the Yellowstone River plunges, owe their existence to the tremendous volcanic forces that have affected the region during the past 2 million years. The caldera is buried by several extensive rhyolite lava flows erupted between 75,000 and 150,000 years ago. 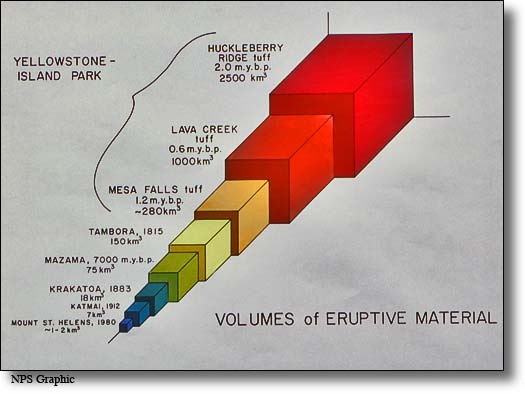 The geological history of Yellowstone National Park worries many observers about a super volcanic eruption that potentially could destroy much of the United States. The Earth's crust beneath Yellowstone National Park is still restless. Precise surveys have detected an area in the center of the caldera that rose by as much as 34 inches between 1923 and 1984 and then subsided slightly between 1985 and 1989. Scientists do not know the cause of these ups and downs but the surmise that they are related to the addition or withdrawal of magma beneath the caldera, or to the changing pressure of the hot groundwater system above Yellowstone's large magma reservoir. Scientists have traced Yellowstone's origin to a hot spot in the mantle, one of a few dozen such hot spots on Earth. Buoyant material from a hot spot rises through the upper mantle, bringing heat from the Earth's interior closer to the surface. The Yellowstone hot spot impinges on the base of the North American plate, one of several rigid plates that make up the Earth's crust. 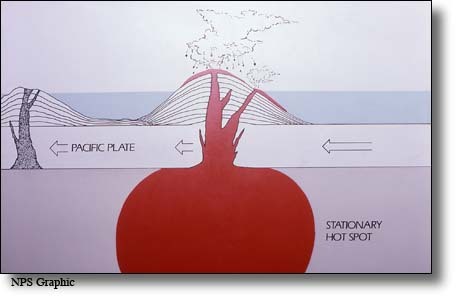 These plates move a few inches per year with respect to the stationary hot spots and each other, sometimes causing great earthquakes as the plates collide, grind past one another, or split apart. 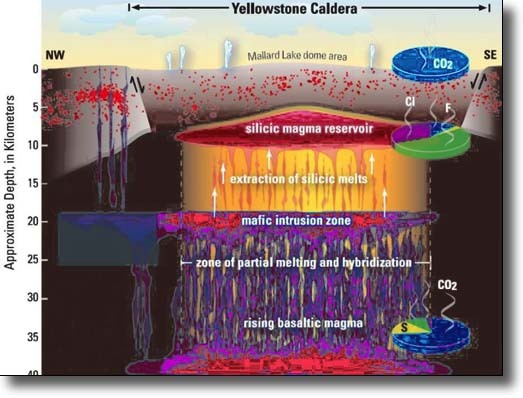 There is abundant geophysical evidence for residual partial melt beneath Yellowstone Caldera, and the consensus among those who have studied the area is that the Yellowstone magmatic system will likely erupt again. What would be the effect of an eruption? Magma would be flung 32 miles into the atmosphere. Within a 622 miles falling ash, lava flows and the sheer explosive force of the eruption would kill virtually all life. Volcanic ash would coat places as far away as Iowa and the Gulf of Mexico. Six hundred twenty-two cubic miles of lava would pour out of the volcano, enough to coat the whole of the USA with a layer 5 inches thick. 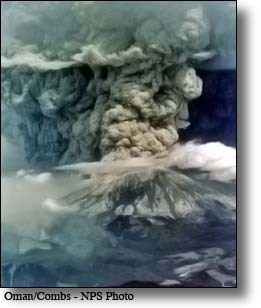 The explosion would have a force 2,500 times that of Mount St. Helens. It would be the loudest noise heard by man for 75,000 years, the time of the last super volcano eruption. Within minutes of the eruption tens of thousands would be dead. The long-term effects would be even more devastating. The thousands of cubic miles of ash that would shoot into the atmosphere would block out light from the sun, causing global temperatures plummet. As during the Sumatra eruption a large percentage of the world's vegetation would be killed by the ash and would cause a huge drop in temperature. Also, virtually the entire of the grain harvest of the Great Plains would disappear in hours, as it would be coated in ash. Similar effects around the world would cause massive food shortages. If the temperature plummet by the 21 degrees they did after the Sumatra eruption the Yellowstone super volcano eruption could truly be an extinction level event. Lithosphere is the outermost layer of the earth's crust. The lithosphere is the only part of the earth that is accessible to us. Lithosphereis cold, solid and rigid whereas as asthenosphere (the mechanically weak ductily-deforming region of the upper mantle of the Earth) is partially molten. The lithosphere is broken up into large solid plates called tectonic plates. These tectonic plates move around which are the basis of plate tectonics. The Snake River Plain evidences millions of years of volcanic activity that took place as the North American continent moved over a relatively fixed magma source, or hotspot. The identification of a clear seismic image of a plume beneath Yellowstone is compelling evidence that the Miocene (the Miocene epoch or the system of rocks deposited during it.) to recent volcanism associated with the Columbia Plateau, Oregon High Lava Plains, Snake River Plain, Northern Nevada Rift and Yellowstone Plateau represent a single magmatic system related to a mantle plume. A rapid decrease in shear velocity in the sub-oceanic mantle is used to infer the thickness of the lithosphere. It is proposed that new and highly precise group velocity data constrain the solutions and imply a thickness of about 44 miles. The lithosphere is the outermost shell of the Earth. It is a relatively thin layer, 50-62 miles thick under the oceans, 93 miles thick on the continents. The lithosphere is composed of the upper crust, 3 miles thick in the oceans and 40 miles thick on the continents, and the upper mantle, which make up the remainder. Separating the crust and the upper mantle is the Mohorovicic discontinuity, the point at which rocks become plastic rather than solid. Beneath the lithosphere is the asthenosphere that continues the upper mantle, and is approximately the point at which the mantle becomes a liquid. Eons ago the places mentioned above where above the Yellowstone hot spot, but continental drift has moved the lithosphere west, but the magma plume remains stationary in its position beneath the lithosphere. 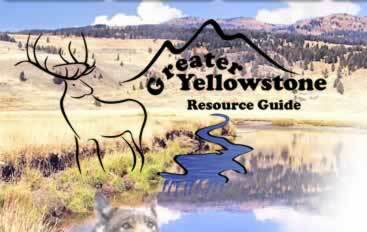 Yellowstone is a dynamic place (a force that stimulates change or progress within a system or process) and a large piece to the puzzle of world geographic dynamics, a geographic dynamic that alters world ecologic dynamics. I reside about 150 miles south of the Yellowstone Caldera, and it is a comfort for me to know that if it blows in my lifetime I will be instantly vaporized; this is the easy way out. Much of the world’s population will starve to death and will be trying to survive chaos of a world without order until the do. Yellowstone’s super volcano someday will change the world, but odds are it won’t be for thousands of years long after we and most of our progeny are long gone.